(Corvallis, Oregon) - Forest Park in Portland is one of the most talked about parks in the country - and rightly so. At over 5,000 acres, it is one of the largest urban parks in the world and the only city wilderness park anywhere in the United States. The paperback not only includes information on the history, geology, vegetation and wildlife of the park, it has full-color trail maps for 29 hikes, a fold-out map of the entire park and its watersheds, and more than 80 photographs of its flora and fauna. From the discoveries of Lewis and Clark to the influential role of a Portland businessman named Garnett “Ding” Cannon, the origins of Forest Park have political, social and geologic roots that Houle describes in a section about its history. 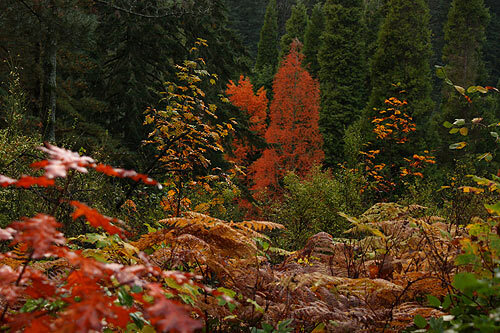 A handy plant checklist allows budding botanists to locate and identify some of Forest Park’s native vegetation, including the red huckleberry and tall Oregon grape, as well as introduced species, such as the American chestnut. Beware of the stinging nettle, however, and a handy photo guide helps readers identify it and other plant species. If you’re a birder, Houle has another check list for both common and rare birds known to visit Forest Park. She not only categorizes them by type (warbler, swallows, kinglets, etc. ), she indicates the time of year when they are most likely to appear, their relative abundance, and whether they nest in the park. The hiking guide should be one of the book’s most popular features. Cyclists and horseback riders are allowed on some of the trails, and hikers can choose between hikes ranging from a couple of hundred yards to more than eight miles. All of the maps in the book were created by Erik Goetze, a Portland cartographer and photographer. Houle is a resident of Sauvie Island, near Portland. She is the author of “Wings for My Flight,” which received an Oregon Book Award, and “The Prairie Keepers: Secrets of the Zumwalt,” a New York Times Earth Day selection. Copies of “One City’s Wilderness” are available in local bookstores or may be ordered online at http://oregonstate.edu/dept/press/o-p/OneCity.html or by calling 1-800-426-3797. Monday, Nov. 29, 5:30-7 p.m.: Book Release Celebration, sponsored by Forest Park Conservancy, at Northwest Natural, 220 N.W. 2nd Ave. Portland, Oregon.